I love New Year’s. It’s one of my favorite holidays. I love the newness, the blank slate ahead, just waiting to be written on. This year it holds extra meaning for me, as it marks one year since I began Feast + West. 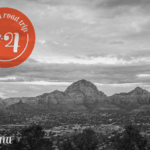 I dreamed up this blog over the course of several months, and I picked Jan. 1, 2014 to start it. A new year’s resolution of sorts. To be totally honest, I’ve never been any good at keeping resolutions. 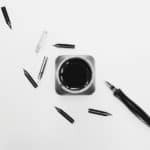 It’s exciting to me that here I am a year later, with an ever-evolving blog that I still love writing for. Not to mention my amazing readers and the host of friends I’ve made online and met in person as a direct result of this blog. I’m kind-of in awe at everything that’s happened in my corner of the Internet this year. 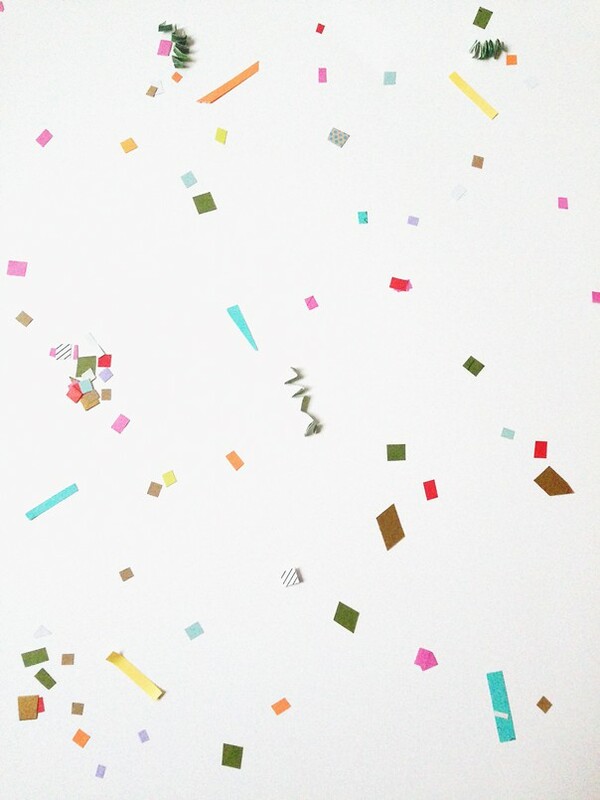 Gather up all the colorful paper you can find. (I had the best luck with envelopes from birthday and holiday cards I received this year.) 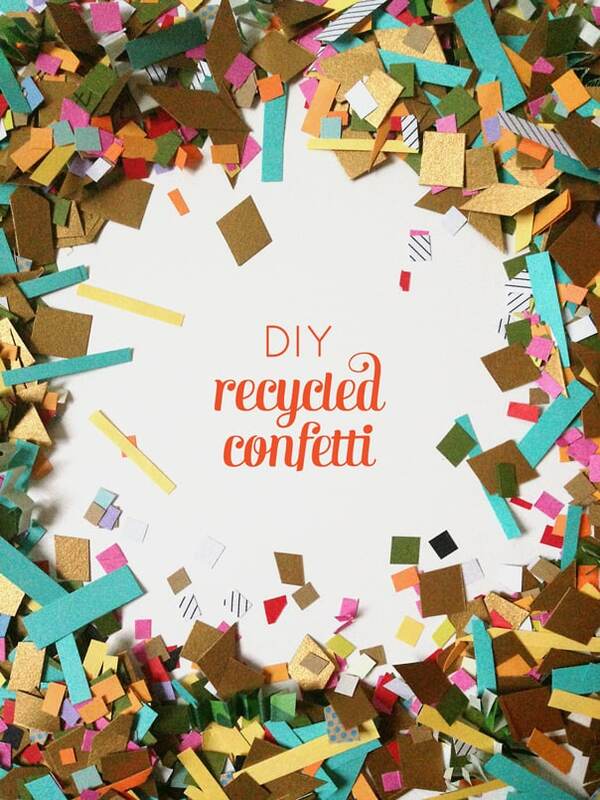 Envelopes, maps, magazines, wrapping paper, newspaper — anything goes for DIY recycled confetti. And then pull out your scissors and get to cutting. There are several techniques you can utilize to get different shapes. 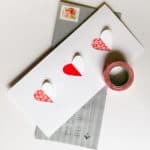 I like the organic variety of shapes you get from hand-cutting the paper, but you may certainly use a paper cutter, an X-acto knife or a hole punch if you prefer. You’ll probably want a bowl, tray or box to cut over and into so as to avoid mess. To get squares or long strips: Fold a piece of paper in half. Hold the paper at the fold and cut in a perpendicular line from the open end toward the folded end to create a double-sided fringe. 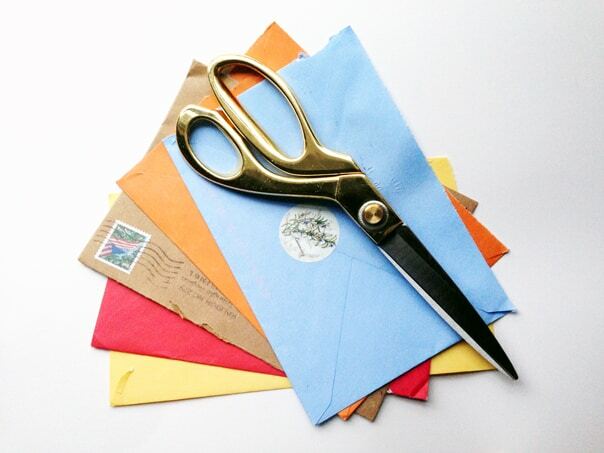 Then, cut parallel to the fold. 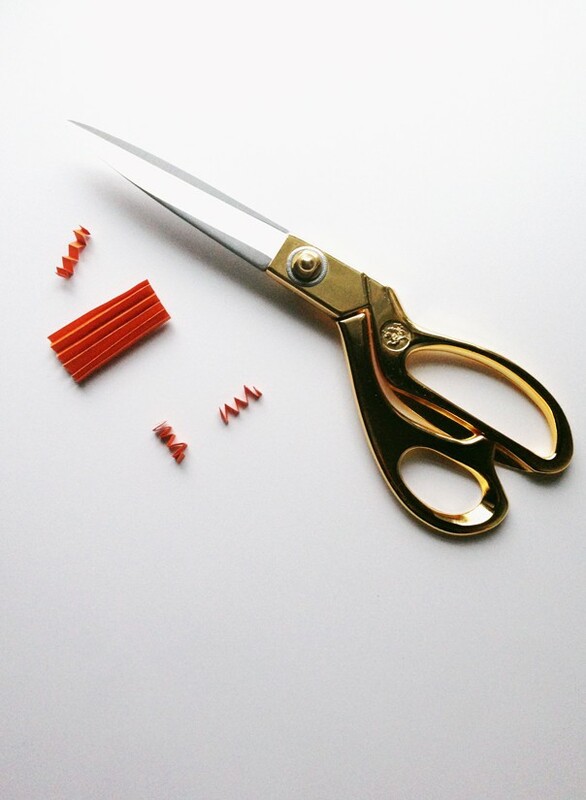 You can cut any length — squares, rectangles, long strips. You can even cut at an angle to get a different sort of shape. To get zigzag pieces: Fold a piece of paper accordion-style. Cut into thin strips. Pull apart slightly if desired. Cutting all this paper may take you an hour or two, but it’s a great snow day activity or something to do while you watch a Netflix marathon. I should add that it’s preferable to use confetti inside. 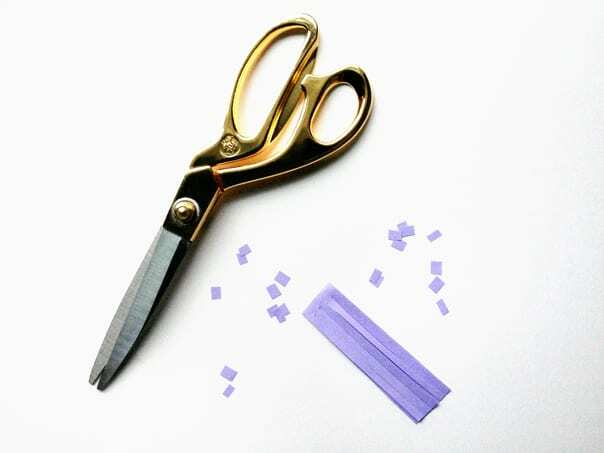 Confetti is easy to sweep and vacuum, but who knows where it will go if you throw it in the street. You may also toss it into your compost pile or your garden when you’re through with it. 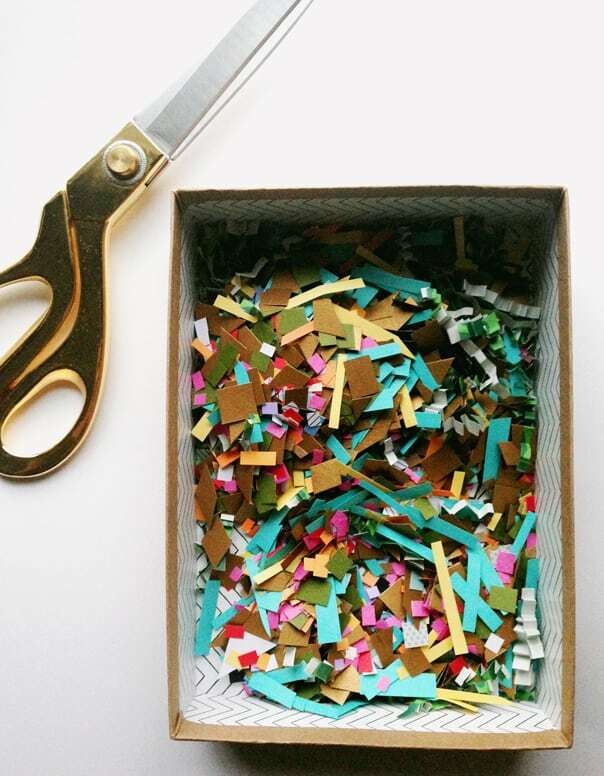 Store any leftover DIY recycled confetti in a box or jar in a dark, dry place. It makes a lot. If you don’t use it all up on New Year’s Eve, save it for using at birthday parties or weddings throughout the year, or tucked inside letters and cards. 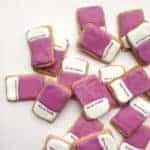 This is such a fun DIY! It’s the perfect way to ring in the new year. So happy I got to know you this year and I can’t wait to see what 2015 brings! Ditto, Katie! Can’t wait for more fun collaborations this year. 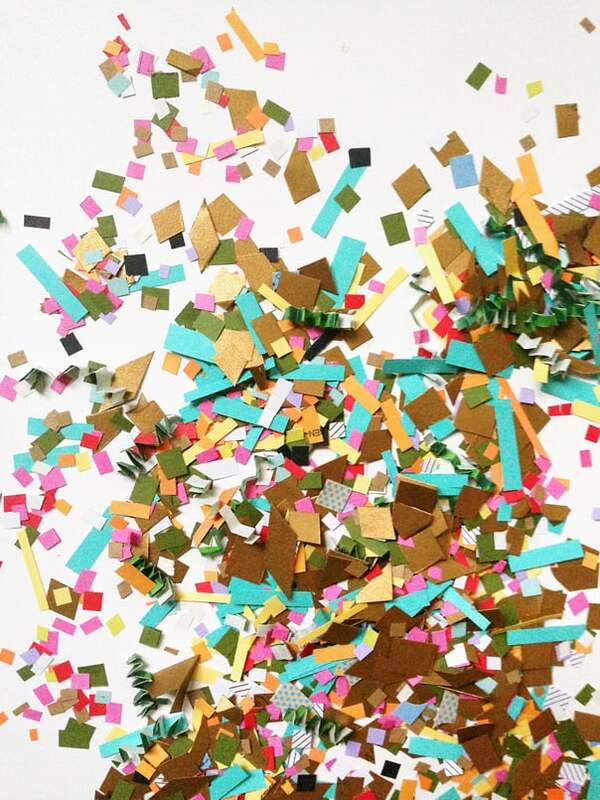 You’re the [confetti] bomb! Right? Why throw those pretty things away? So much more fun to reuse them. This looks perfect for NYE! 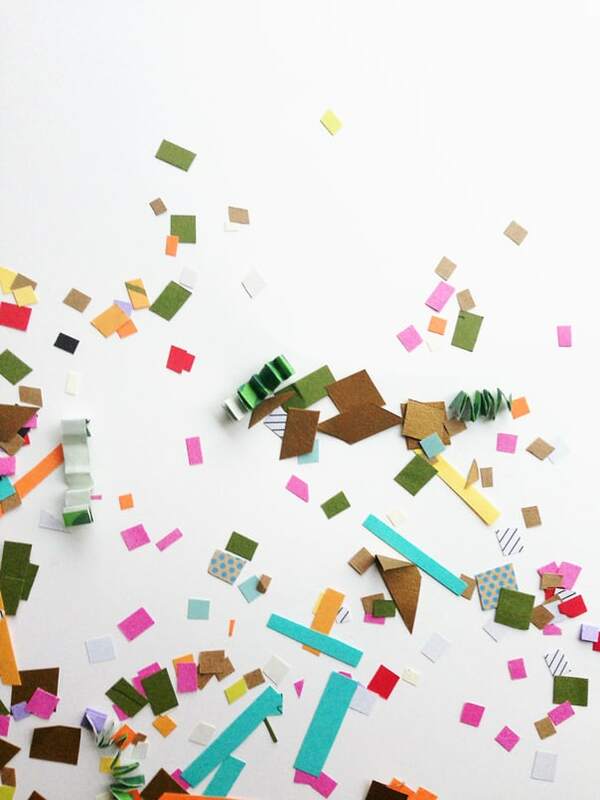 I am definitely a lover of paper goods, envelopes and anything like that and making confetti out of things you already have is such a good idea. Will have to try this the next time I need confetti! For sure! It’s so easy to make and I love all the unique shapes you can make! Thank you, Lee! I really appreciate you stopping by.